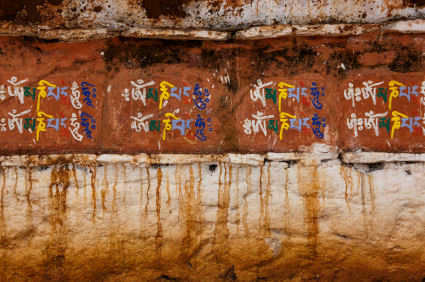 Dzongkha is Bhutan’s official language. It literally means ‘the language spoken in the dzongs and administrative centers in all the districts of Bhutan’. It has its roots in the old-Tibetan language, spoken by the people of Western Bhutan. In 1992 the first edition of a book was published, describing the grammar of Dzongkha. Besides Dzongkha there are two major languages spoken by the people of Bhutan: Sharchokpa (spoken in Eastern Bhutan) and Nepali (spoken in Southern Bhutan). Because of the ethnic diversity of the Bhutanese people, there are also 19 dialects and languages spoken throughout the country. You will be able to communicate with many in English though; it’s the instruction language in schools and therefore widely spoken. Choey gi Ming ga chi mo? Na gi Chen ga chi mo? Lam di gathey jo ni mo? Dikhar lay tharee gademchi mo?